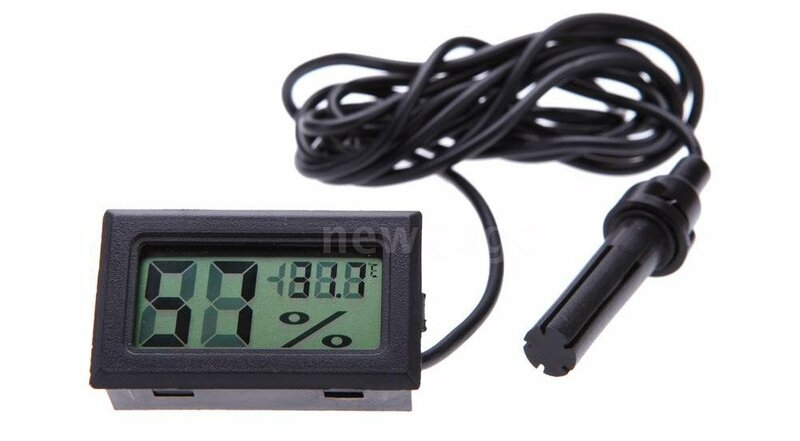 Hive instrumentation - has anyone tried a thermometer? Posted: Tue Aug 23, 2016 6:51 pm Post subject: Hive instrumentation - has anyone tried a thermometer? Has anyone tried adding a thermometer or hygrometer to a hive? I've sat watching the entrance at bees fanning today and wondered is it too hot and found dead larvae in the floor tray and wondered has the brood got chilled on a cold night. These sensors are cheap and could be glued to the underside of the crownboard. Over the winter you could see if the colony was still alive. Yes I believe other people have tried sensors in the hive although the bees propolising them has caused problems. I think there is a danger in using something like this as it can tempt you into making modifications to a hive that perhaps doesn't need it. Bees generally are pretty good at regulating their temperature as necessary although I appreciate what you are saying about that brood possibly getting chilled as a result of the super you put on. That said, it is the centre of the brood nest where the temperature matters not at the crown board and it would be difficult to know how your reading related to what the bees need in different areas of the hive. You might end up misinterpreting a result and making things more difficult for the bees in stead of being beneficial. I think hive atmosphere is a very complex balance and whilst I have no problem with researching it using sensors, I think then using the data to change their environment towards something that we "perceive to be better", is dodgy ground. Ie opening up the entrance or removing a slide out bottom because the sensor suggests they are too hot, when the bees may in fact be quite happy with their environment. At the moment they will be fanning to ripen honey rather than to cool the hive.... which is an example of how easy it can be to misinterpret things. I .... at last... did inspections on my 5 hives yesterday. Weve had very cool wet weather here in west of Ireland, yesterday it at last got up to 18c with that bright thing called a 'sun'!. Before I went in I did notice 2 hives very busy fanning the hives and I guessed they were ripening honey. Was a great feeling to see all the hives doing well. Don't think Id use anything as Barbara says. Learnt that from when I tried a endoscope and the bees did NOT like it. Earlier this summer we had extremely hot temps and I thought then the combs would be falling off... no such thing... the bees knew best what to do. Hi Ollie, I agree it is good to find your bees are doing well. After initial problems with this, my first hive it's good to see things looking what I understand to be 'normal'. On the Balanced Beekeeping course I was referred to Ed Clarke's book on Constructive Beekeeping and this thread which I'll have to work through. I haven't read it but I think it suggests that a few bees fanning at the entrance isn't going to provide enough airflow to ripen the amount of honey collected. Just an indication. The engineer in me likes this stuff. Ben, I suggest you take a look at this website: http://www.bushfarms.com/bees.htm Mike Bush answers most questions a new beekeeper might come up with and many you won't have thought of. I find his advice invaluable. Particularly the one about not doing anything at all if you are not sure! Happy Bees. . . are you hacked into my system? . . . . because I have just watched about 3 hours of Mike Bush Youtube videos!! Such as. . . There is SO much here. He's made me question many things that I was thinking of doing specifically ventilation (top entrances, the need to get rid of moisture ? ?not sure on this one?? ), feeding syrup outside rescuing starving colonies (pH differences honey/syrup), using foundationless frames (excessive cell size in polluted foundation), not treating for varroa (we're creating wimpy bees and mutant mites), inspection frequency (not every 7 days all season), . . . I think I've forgotten half the issues he brought up. Thanks for the recommendation. I concur. . . strongly. Started this thread wondering about using technology, a simple electronic thermometer. Came across this and felt deflated, it's all been done and so much more thoroughly than I could or even imagined . . and it has an app!! and uses TLAs like #IoT, links to TED talks, Deep learning software on the Cloud, extreminate varroa with automated brood chamber heating, 3D printing of hive components, WiFi/4G. Crumbs.
. . . but "We suggest making sure you find a local beekeeper for those few times where a manual inspection is required." So someone into tech and by default with the money can leverage for themselves years of experience and learning but poor bees. The filing cabinet hive became computerised. I'm not going down this route any furthur. So pleased you discovered Michael Bush instead.....I'm convinced our use of and reliance on technology will be our downfall in the end, as we will lose the ability to think things out for ourselves and relate to our surroundings and maybe even our fellow humans other than through some sort of device.